The director behind Halloween and The Thing believes Dead Space is "ready-made" for a film adaptation. Not everyone considers the Dead Space games to be survival horror anymore, but they've certainly earned the affections of fans. Among their numbers is none other than John Carpenter, the director behind such influential horror and science fiction movies as Halloween and The Thing. Back in February, Carpenter even took to Twitter and described Dead Space 3 as "the first great game of 2013". 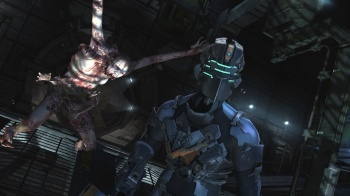 Carpenter recently elaborated on these thoughts in an interview with GameInformer, saying that if given the chance he'd enjoy adapting Dead Space into a full-length feature film. "I would love to make Dead Space. I'll tell you that right now. That one is ready-made," Carpenter says. "I maintain that Dead Space would just make a great movie because you have these people coming onto an abandoned, shut-down space ship and they have to start it up and something's on board. It's just great stuff." A Dead Space Carpenter movie would be an intriguing project, helped greatly by his status as an avid gamer. "My son got me involved in games when he was growing up," he explains. "He and I spent time together playing. He got me hooked on it." Carpenter names Assassin's Creed 3, Dishonored, and God of War as personal favorites, and even shares gamer frustrations on how Aliens: Colonial Marines turned out. "It's just another marketing issue. They're trying to get you to buy the game, which I stupidly did." There doesn't appear to be plans to produce a Dead Space movie, at least not yet. Still, the very idea of putting The Thing's director in charge of a potential film is giving me all kinds of goosebumps, considering his experience in horror and sci-fi. If a Dead Space movie wasn't an option, Carpenter's knowledge of games could still make him ideal for other movie adaptations, even just as a producer. With Carpenter behind the scenes, maybe we'd finally get that now-mythic "good" videogame movie that always seems just out of reach.